Before we carry on, special plug for this Ana Mardoll post, in which she reviews Man of Steel. I feel it’s topical, since she discusses just how much women’s reproductive choices are being manipulated, and how they are being tampered with right now. Does it seem odd to you that I would read a critical review of a movie that involves looking at women’s reproductive rights just as I am critically deconstructing a book that deals with the same topic? It could be a coincidence. Or it could be that we have a problem, and writers and critics are trying to tackle the topic - the first by writing about it, the latter picking it out and displaying it for what it looks like. A free society cannot force girls to have children, but a free market can richly reward those who do. McCafferty, Megan (2011-04-26). Bumped (p. 64). HarperCollins. Kindle Edition. I assume this didn’t sold like hotcakes at the time because it was so dry and academical nobody could understand it. I mean, why else would Ash and Ty decide to adopt a girl to use as their very own guinea pig instead of rolling in the cash they got from royalties? And, just in case you didn’t understand, it’s not enough that society tells girls that they are only worth as much as the content of their uterus at a certain age, you need to add a thick layer of monetary incentives to it. If you don’t pregg, you’re not only refusing to fulfil your “feminine promise”, your “biological imperative”, but you’re also condemning yourself (and possibly your parents and siblings) to a life of debt and poverty. Again, this isn’t sci-fi. Some of this is happening right now. But of course, we’re not meant to take any of this seriously because this is YA, aka a lady genre, aka not worth discussion or critical evaluation. Which is strange - after all, we’re the ones with the uteri. Anyway, we find the twins sleeping in the same room, Harmony having crept in to sleep on Melody’s floor after she found the guest room too quiet. Which can be either endearing or creepy - your choice. In case you’re wondering about the continuity of this, we flashback to the afternoon before, when Harmony returns to the house and finds Melody practising soccer. I nervously patted the netting on my veil. “Did Zen help you pick that out?” she asked. “No,” I replied. McCafferty, Megan (2011-04-26). Bumped (p. 67). HarperCollins. Kindle Edition. Melody leads Harmony into the guest room, which is, as she says “totally recycled”. As is the rest of her house, by the way. Which is a nice little touch - it’s good to know that there are people in this world who use their wealth in ways which are helpful to the environment. And since Ash and Ty are economists, we can only assume that this was also a good investment and that there is a demand for recycled houses which is high enough to make it a profitable purchase as well as a fashion statement. McCafferty, Megan (2011-04-26). Bumped (p. 68). HarperCollins. Kindle Edition. But she doesn’t apologise outright. Which both sticks to her character (Melody doesn’t like to admit to being wrong, ever) and continues to emphasise the shades-of-grey morality of this book. Melody is sorry, yes, but she’s not about to switch her worldview in order to repent. She said some mean things. She tries to be nicer to her sister. There. That’s done. A feature of Good Girl culture is making women overly apologetic about everything. The fact that this is (gently) countered in books makes me a happy, happy critic. We go back to the present when Harmony is startled by a loud voice coming from the MiVu wall (kinda like skyping with a camera, except it’s on the wall instead of your laptop and you can never turn it off.) It’s Lib, Melody’s pimp… err, I mean Reproductive representative, and he’s got the BEST NEWS! EVER! The voice isn’t coming from a visitor. It’s coming from a man projected larger than life-size on the MiVu wall. It’s almost impossible to notice anything about him other than his suit, which is illuminated with electrified stripes of red, orange, yellow, green, blue, indigo, and violet. “I want to see the look on your face when I tell yoooooooou.” He trills the last word, reminding me of a soprano who holds her notes just a beat longer than everyone else in the Church choir. McCafferty, Megan (2011-04-26). 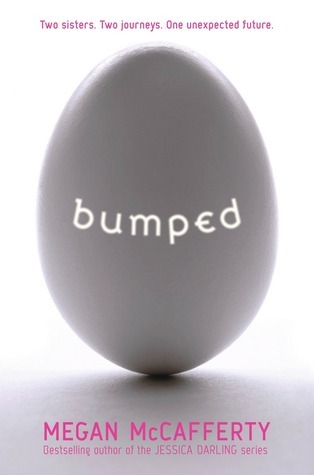 Bumped (p. 69). HarperCollins. Kindle Edition. And… ugh… remember when I said there are things about Bumped that I’m not so wild about? Lib is one of those things. And what about after the Virus has done its work? Is homosexuality allowed then? If adoption is about to become the main parenting model, surely this must be totes okay for gay couples, right? Or perhaps the law-makers are the same constipated shits as they were during the time before the Virus, and they believe a gay couple is more likely to raise a gay kid. Because all hetero couples raise hetero children, obviously. Here’s the thing: it’s never outright stated that Lib is gay. But his portrayal - the flash, the high-pitched voice, the excessive beautifying (never trust a man who tweezes his eyebrows, amirite?) all belong to a stereotypical idea of gay. McCafferty, Megan (2011-04-26). Bumped (p. 70). HarperCollins. Kindle Edition. But hey, what’s wrong with a stereotypical portrayal. I mean, you could work that fine - just check out Anne Whitney’s “The Art of Love”! What’s wrong with Lib, though, is that, in a novel that’s almost without a specific antagonist, he’s the closest we’ll get to a villain. And his portrayal, combined with the insignificance of the only other gay mention in this book… well, you can read connotations into that. And it’s not even the first time McCafferty’s done this. “Bumped” doesn’t completely copy these character archetypes, but it doesn’t stray from them either. And while I could forgive “Sloppy Firsts” and the rest for focusing more on Jessica’s life than her gay acquaintances (you can’t quite call them friends), “Bumped” is a story about reproductive rights. Having QUILTBAG characters isn’t just a box to check! Now that I get a better look, I see that Lib is bald, save for a silvery inch-wide strip of hair running front to back across his scalp. His skin is as brown as an acorn, and his face is stretched taut and unlined, as is often seen in older men of means in Otherside. Even the skin in his eye sockets is pulled tight, making them bulge in surprise at all times. Those lavender eyes are scrolling up down and all around as he takes in my appearance as carefully as I am taking in his. Usually this would make me feel uncomfortable, but something about Lib tells me that he’s not looking at me with impure interest. McCafferty, Megan (2011-04-26). Bumped (p. 71). HarperCollins. Kindle Edition. One last observation before we move on - hey, look at this condemnation of artificial beauty! Coming from, you guessed it, someone who is conventionally attractive! In a society that values physical attractiveness! Holla! Okay, seriously, this chapter is doing me in. To wrap this up - Lib mistakes Harmony for Melody and tells her that none other than the infamous Jondoe will impregnate her, and soon! That’s all the plot we’ll get in this chapter, but as usual, the plot is the least interesting thing about it. Harmony tries to tell Lib she’s not Melody several times, but then she sees the latest Tocin add. McCafferty, Megan (2011-04-26). Bumped (p. 76). HarperCollins. Kindle Edition.